St Albans Child Contact Centre is a safe, friendly and neutral place where children of separated families can spend time with the non-resident parent, and sometimes other family members. Contact Centres are not intended as a long term meeting place for families. The hope is that parents will, after a while, be able to make their own contact arrangements independent of the Centre. • there is a separate room where the resident parent can wait if they wish. The Centre is run by fully trained volunteers. They are impartial, so they do not take sides, and strict confidentiality applies. Further information is available in our Welcome leaflet which can be downloaded here. The Centre opens on the 1st and 3rd Saturday each month (except Christmas and New Year) between 10:30 and 12:30 and a full list of dates can be seen here. 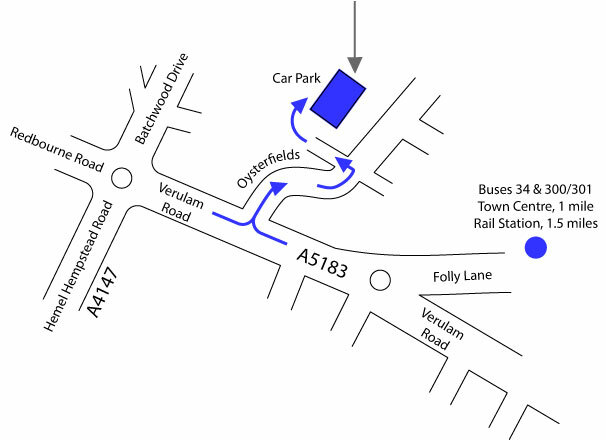 Warning: This Sat Nav Post Code is approximate - please follow the directions below from Verulam Road (A5183). Turn into Oysterfields from Verulam Road (A5183). Take the first entrance on the right Immediately after the uphill left bend. You can see garages at the end of the entrance way. The Scout Hall double gates are on the right before the garages.